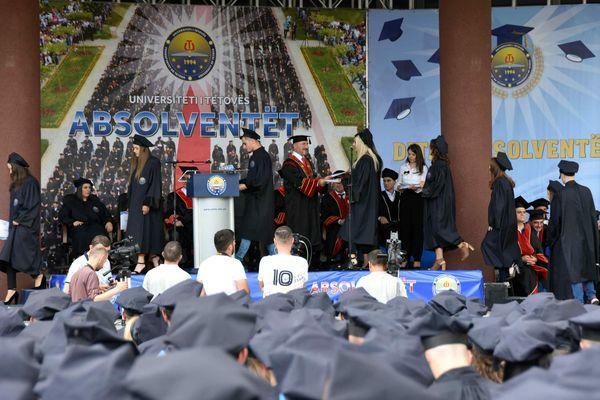 University of Tetova, today organized the cap-throwing (graduation) solemn ceremony of senior undergraduates of the generation 2017/18. 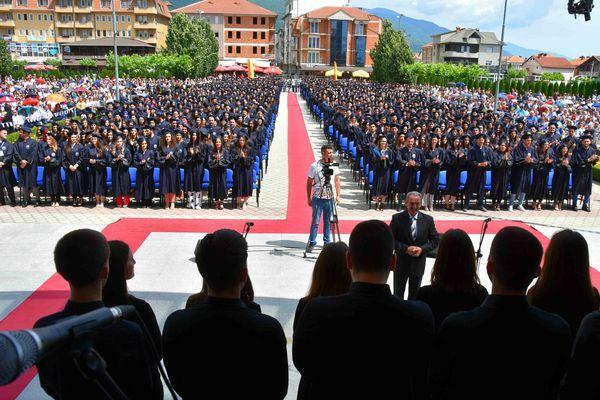 About a thousand of senior undergraduates of this university, today at the Rectorate’s court in front of their parents, family members, friends, colleagues and their professors celebrated the completion of the first cycle of studies. 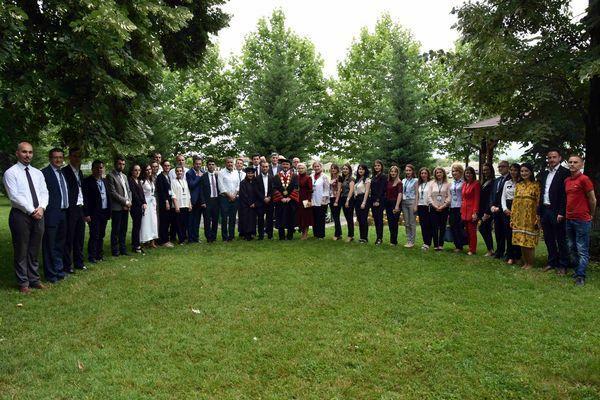 The event was declared open by the Vice-Rector for International Relations of the University of Tetova, Prof. Dr. Arbër Çeliku. 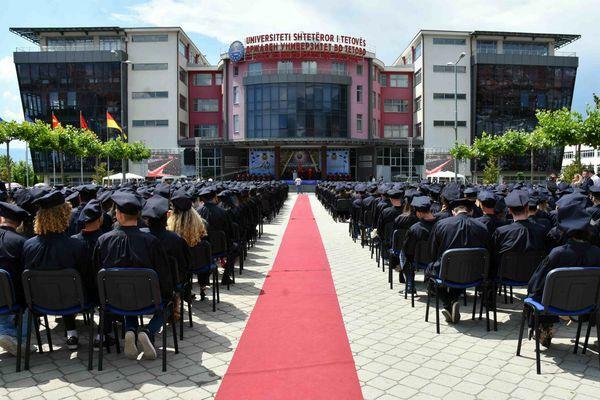 In front of the senior undergraduates he e said that it is a pleasure to see the senior undergraduate students celebrating, as according to him, the first generation and others in a row, until the formalization of the university, have had the bad luck by experiencing all the political turbulences of the beginning of pluralism, accompanied by the state repression.” Hard infrastructure conditions, studying in a capsule, without even having a single day just to see a European university, while the your generation not only did not experience these, but you were partners in building of the University, you have had excellent infrastructure conditions, enjoyed the freedom of expression, professors you had as your parents, and most importantly, that we have not dreamed of, you celebrate with pride and dignity the day of your graduation, in a great atmosphere and performance, together with your rector, parents, relatives, colleagues and other important political and social figures”- said Prof. Dr. Arbër Çeliku. 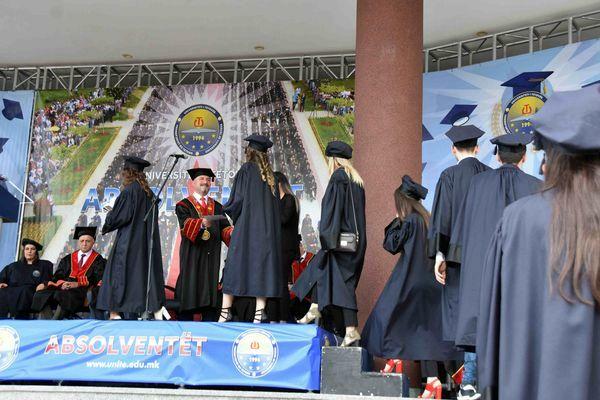 The cap-throwing ceremony of senior undergraduates of the University of Tetova was attended by the Speaker of the Parliament of the Republic of Macedonia, Talat Xhaferi. 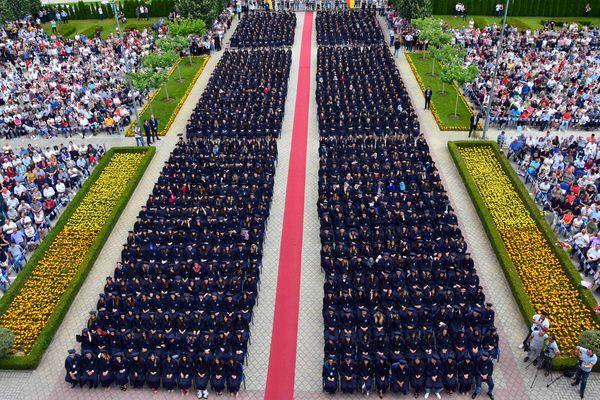 “Honorable senior undergraduates that this day marked for you and on this occasion we are all here, humbly to remember your situation in the first days here that when will come the last day, to be released from the teaching obligations. 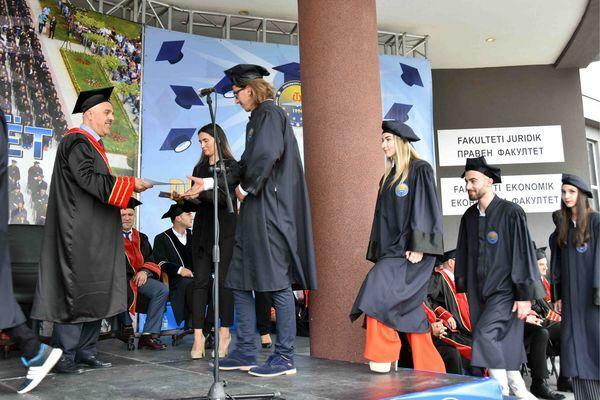 I believe that today you understand how we all understood that we have walked this way, that here does not end your commitment, but here you have realized that now your engagement begins in your professional, institutional growth, and on your new obligations that await you in life. So, be convinced that here your life begins in the sense of what the future for work is waiting for, what you have learned here you will share with others and for others. 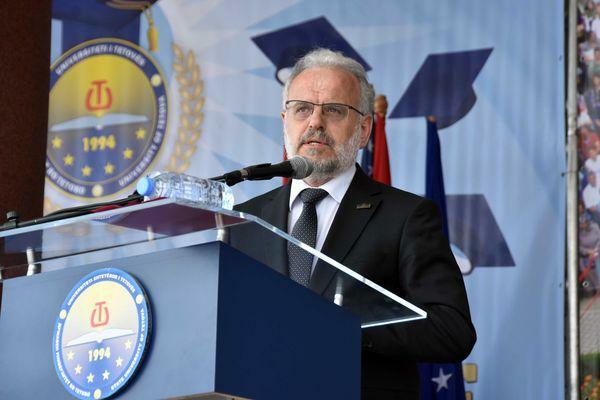 By wishing to pursue future successes in every respect, both in health and family, emotionally to be quiet, that you can be committed to the new obligations that you expect in life” – said Speaker of the Parliament of the Republic of Macedonia, Talat Xhaferi. 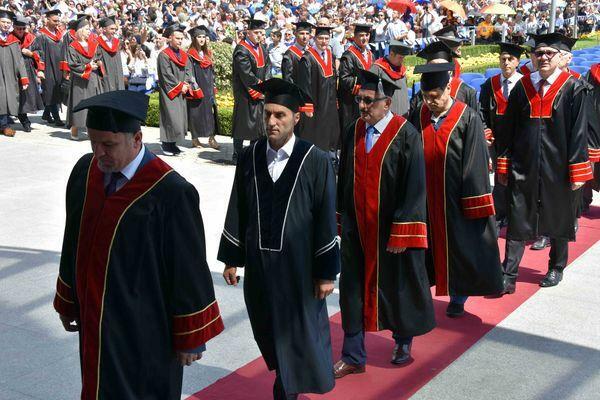 While the Minister of Education and Science, Doc. 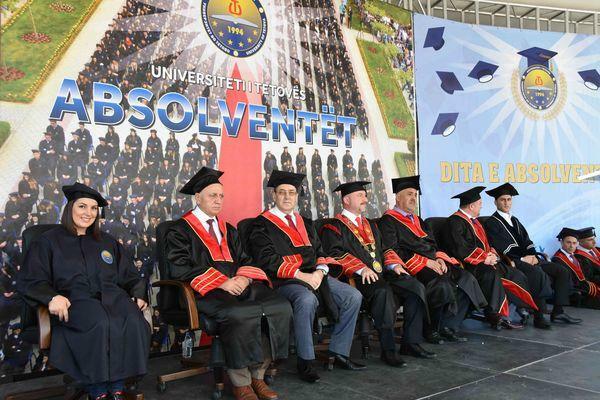 Dr. Arbër Ademi, in his speech promised that this university will never be forgotten by the state and that during his mandate as minister the support for the University of Tetova will be further enhanced and this shared pride of Albanians will continue to grow. 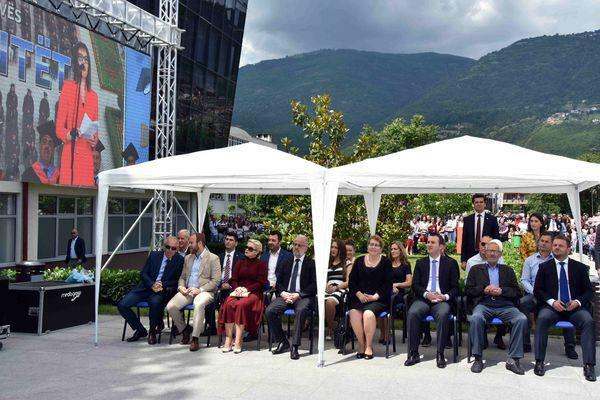 “I will take this opportunity to congratulate you on formalizing the education process in one of the most modern universities in the country and in the region that exists and teaches for 23 consecutive years. 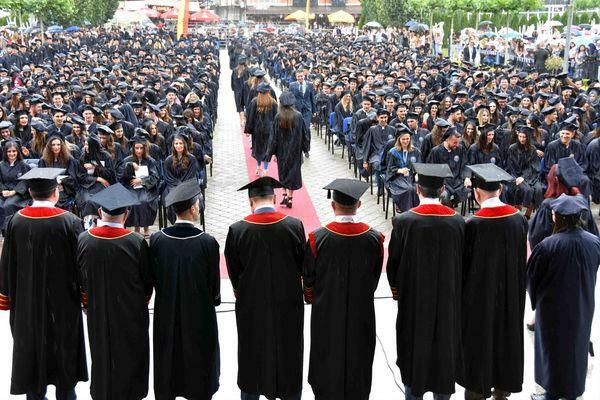 All of you will receive a diploma, which will be a confirmation of what you have learned. I’m convinced that as soon as possible, you will be able to provide adequate work engagement and solid material benefits. 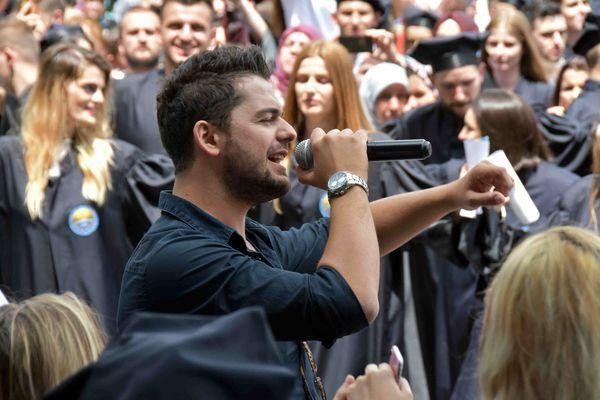 I have no doubt about the quality and competiveness of the knowledge you have gained at the University of Tetova. 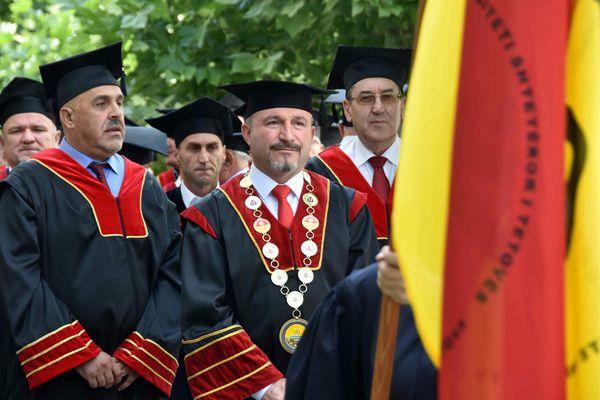 I congratulate you on your success so far and I advise you never to give up on learning” – said Minister of Education and Science, Doc. 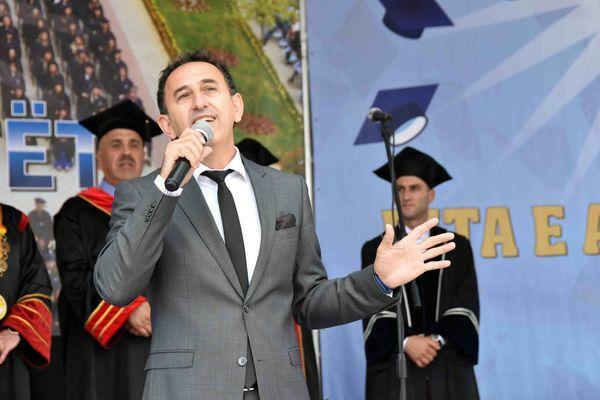 Dr. Arbër Ademi. 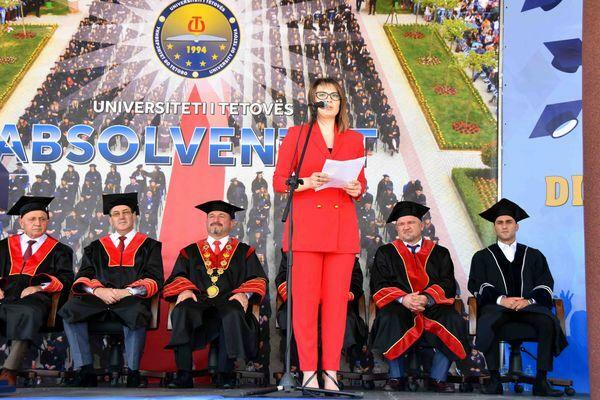 On behalf of the senior undergraduates of 2017/18 with welcoming speech addressed the President of Student Parliament of the University of Tetova, Donika Kamberi. She said that the University of Tetova is an undeniable reality. 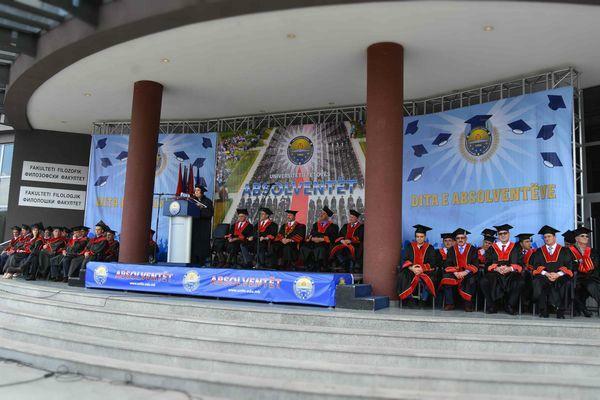 “Honorable senior undergraduates, dear parents, respectable colleagues and friends of the University. There is a great difference between reality and unreal, between what exists and what does not exist, between truth and falsehood. University of Tetova is an undeniable reality with unique content, and above, really. It exists and is ahead of you. As you are sitting today, with a view toward the university, so enthusiastically you should see this university in the future. 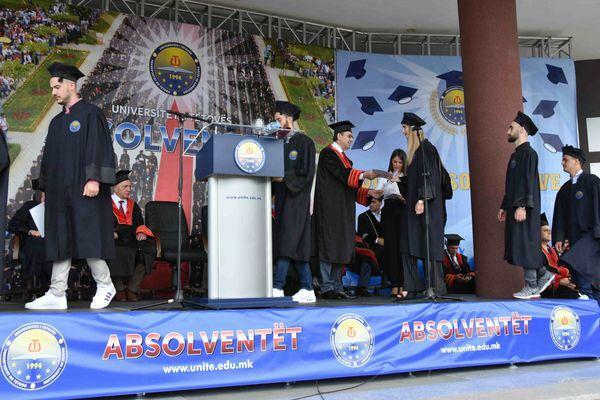 No matter where your life will bring you, in the private or public sector, in the legislative, executive or judicial, within or outside the borders, we all have a moral obligation to set up a brick for building the university. This brick does not necessarily mean something material, brick can be a good word, a good deed, a good critique and a proper advice, and above all a dignified defense of the University, exactly from us. Despite the storms that have struck the University of Tetova, there is always a staunch and unsettled determination of the intellectual class that stood today behind me. This determination and their vision must be embodied in all of us, to persuade us not to believe in disoriented clan traditions, but to believe only on the basis of human dignity. No matter how cliché it may sound, you will never be successful until you learn to overcome yourself, give something of yourself, although it can be thrown into the water. Kindness and sensuality are the most important signs of emotional intelligence, this intelligence that never disappoints us, overcoming ourselves means giving success from your success and never to regret it. 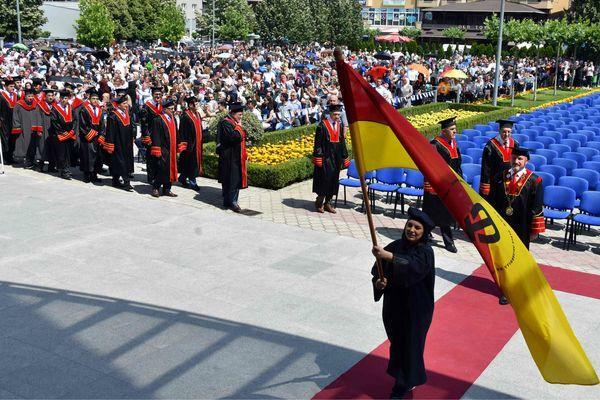 There are not many things that the world agrees unanimously, but I think that all the people on the world are unanimous in their opinion that the importance and value of the university are the same for all”- said Donika Kameri. According to her, University of Tetova remains the largest national asset and the most stoic resistance in the transition years. 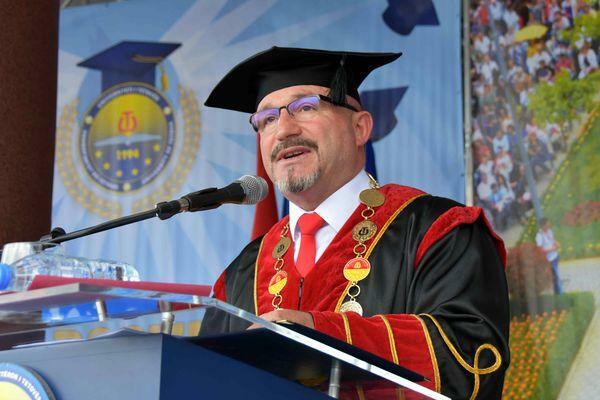 “University of Tetova is a contributor to the national and regional processes, the voice of reason and the force of change, the tool of anyone, but in the help of everyone, therefore we must protect it, love it because as the good has no end, that we are all in search of it, so endless is the path of knowledge and science. 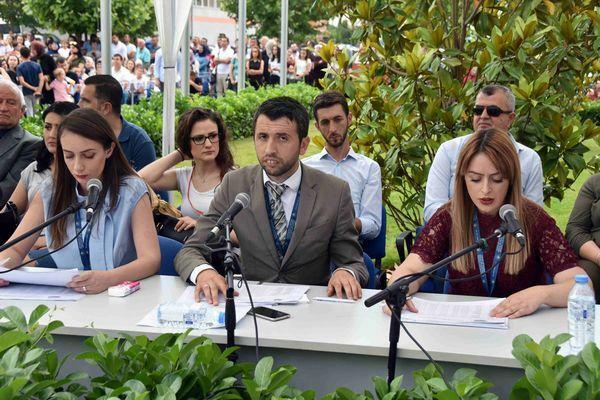 Today, especially, it makes me happy to be able to express myself so loosely and in my mother tongue, which two decades ago was impossible because was fought the Albanian education, and today in two or three decades, not fighting, but we have both language and education guaranteed by a special law. 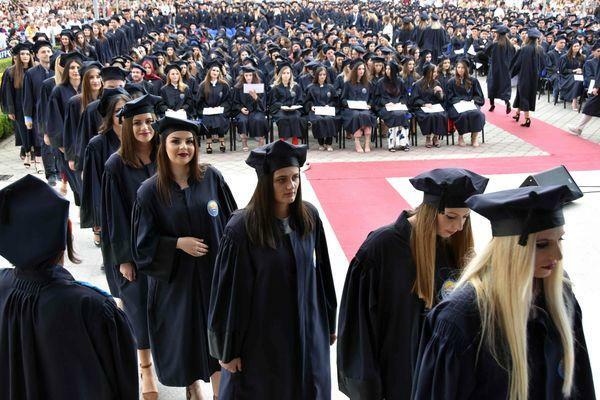 Finally, I wish you the graduation, but if you believe your success ends here, you have a lot of mistake, I have the impression that we are the generation and the luckiest generation our society has ever had. Why, will you say? 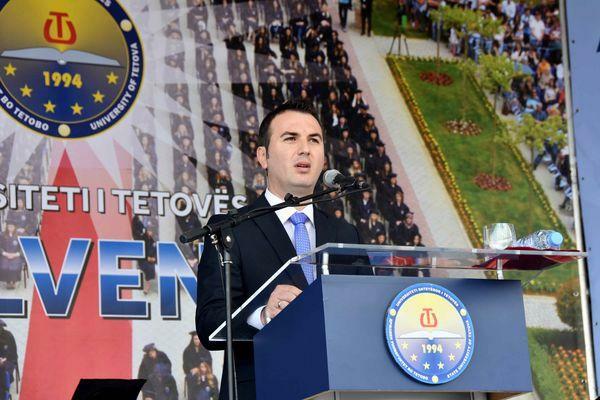 We are lucky because Macedonia will soon join the European Union and other Euro-Atlantic structures, we will no longer be identified by divisive nationalities, but we will be European citizens and we deserve it because we are an inseparable part of the mosaic of the peoples of this continent. I am convinced that at the moment I will ask you any question you will have an answer, but since it is impossible to get the answer from a thousand students, think of the answer all the time. I have it for myself. 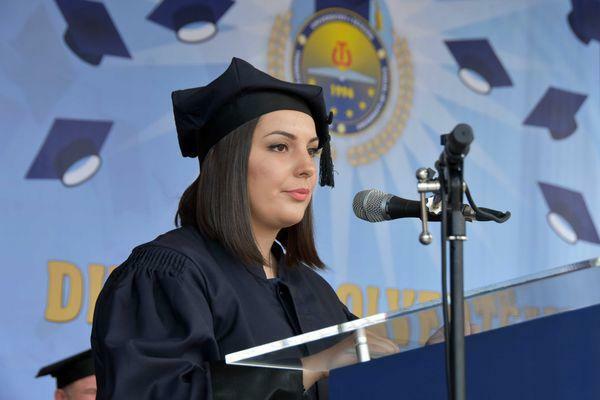 Honorable colleagues, senior undergraduates, do not ask yourself what the University can do for you because it has done a lot, ask yourself what you can do for the University, and if you cannot do anything else, at least do not harm it” – said President of Student Parliament of the University of Tetova, Donika Kamberi. 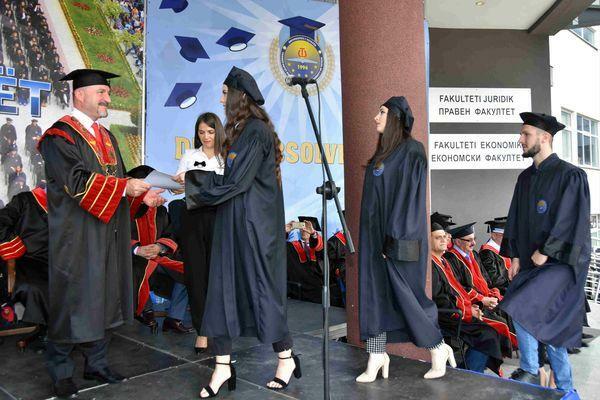 For the all senior undergraduates who attended in the cap-throwing solemn ceremony were bestowed certificates by the Rector of the University of Tetova, Prof. dr. Dr. Vullnet Ameti. 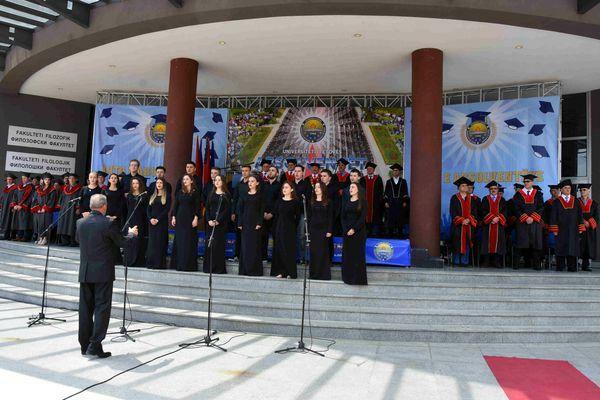 After bestowing of the certificates, the Rector Prof. Dr. Vullnet Ameti in front of senior undergraduates and their family members, said that with a serious commitment, together with the students and the academic staff, we reached today the promotion of the academic year of the academic year 2017/2018, in which case we successfully wrap our objectives for education, science and research. 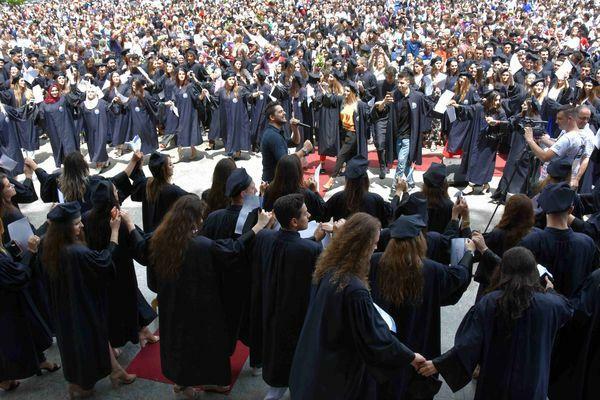 This academic year, in all faculties and study programs of our University, have managed to complete their undergraduate studies the majority of the senior undergraduates, and on this occasion, allow me to express our gratitude to you, firstly to your academic staff, your professors and assistants who have merit for these achievements in the preparation of new cadres in different fields of education and science. 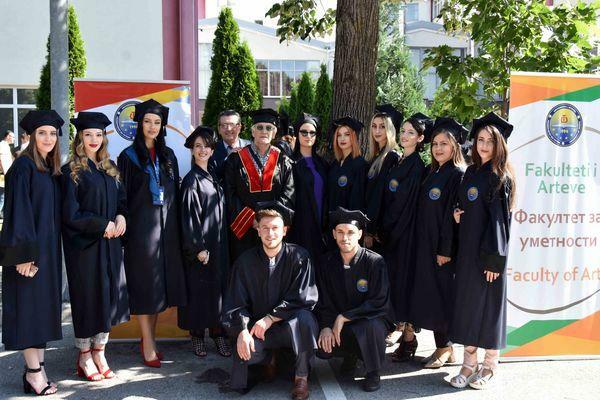 So, today, we are proud to conclude a road that we started together years ago, a road that was not easy, full of challenges for all of us, but above all we had the chance to study and work at emblematic University of education in Albanian language – at the University of Tetova. 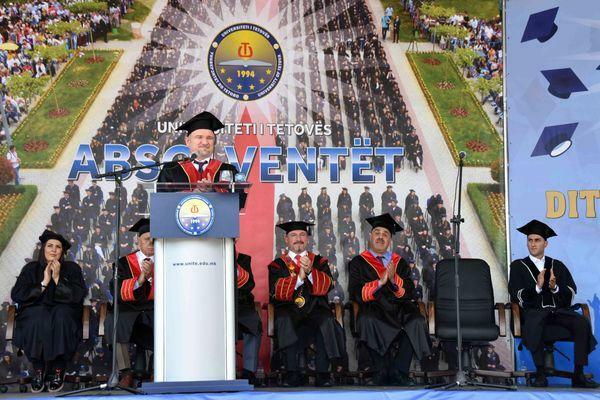 We, in the eyes of our students, we see the light of the future, and this is the only force that drives us forward, to work even more with all our capacities and opportunities, to strengthen our University, the hearth of light and wisdom “ – said the Rector of the University of UT, Prof. Dr. Vullnet Ameti. 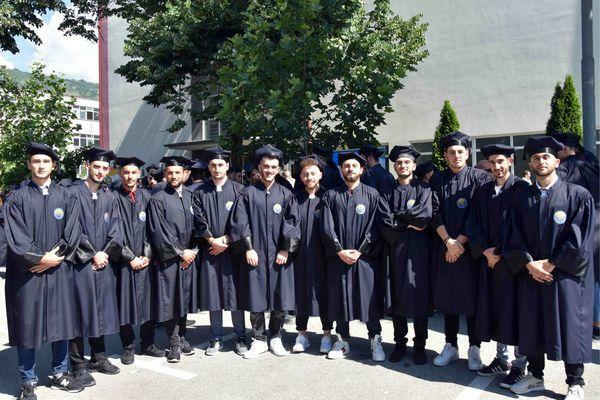 He also said that the graduation of our senior undergraduates is a great event, an evidence of substantial progress that has been made in our institution and it is a proof that all of us have been seriously approaching education and scientific research. 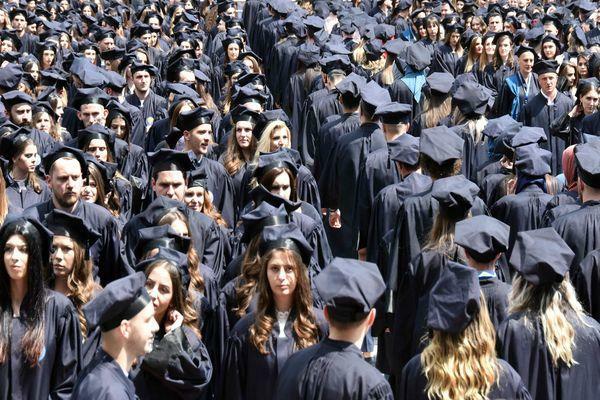 “Honorable senior undergraduates, you, as many generations before you, chose to study at the University of Tetova, successfully pursued the path of education to gain new knowledge and thus contribute to strengthening the society and the capacities of state institutions and private of our country. In front of you is an era of life. 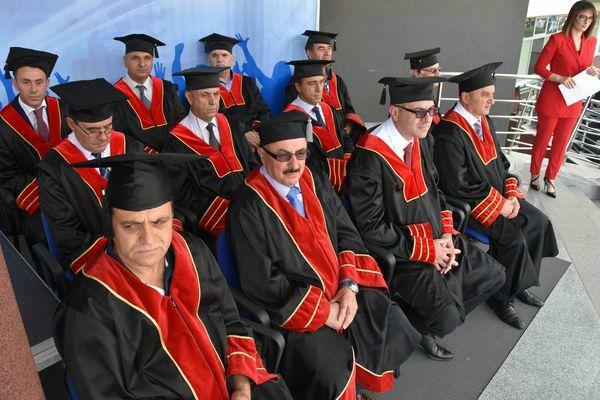 On receipt of diploma you will be able to work in the profession you have chosen. As a Rector of the University of Tetova, I’m fully confident in your ability to start a professional career. Some of you will continue their education in the second and third cycle of studies. 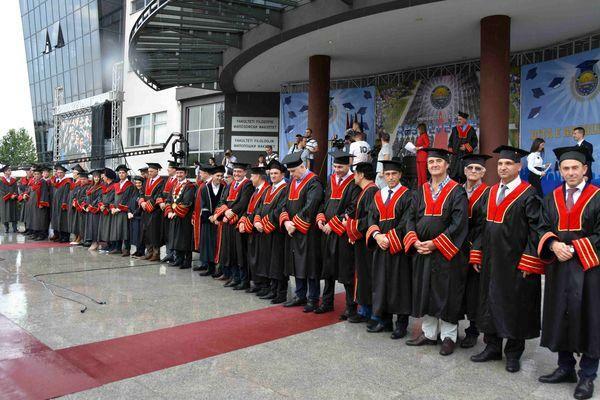 Among them we see the future professors of this institution, who will continue the successful tradition of our current University staff. 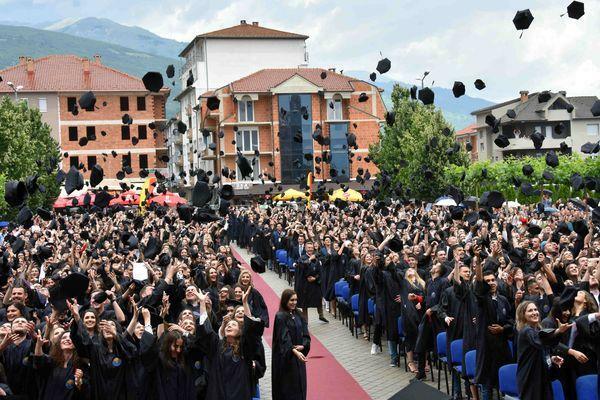 Thank you all for these beautiful years we passed together and I would like to tell you that we experience this great moment as you and your honorable parents who sacrificed contributed to the growth and development of this hearth of light and wisdom. 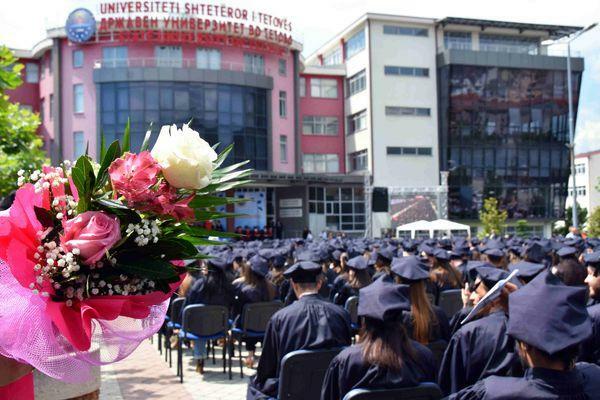 Finally, in my name and on behalf of the University of Tetova, we convey our congratulations to your parents and family members, who have honored us today with their presence, on this solemn day to rejoice together successful completion of the studies of their beloved ones”- said Rector. 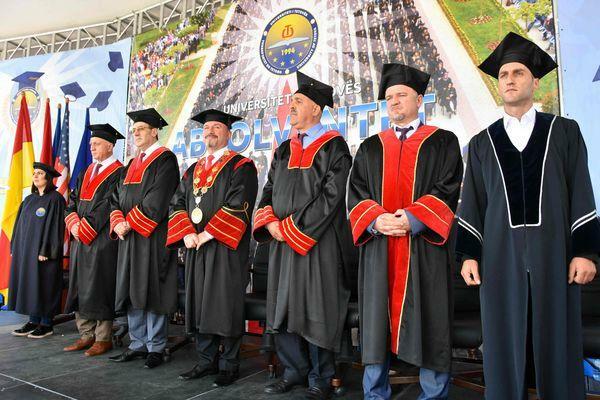 Prof. Dr. Vullnet Ameti. 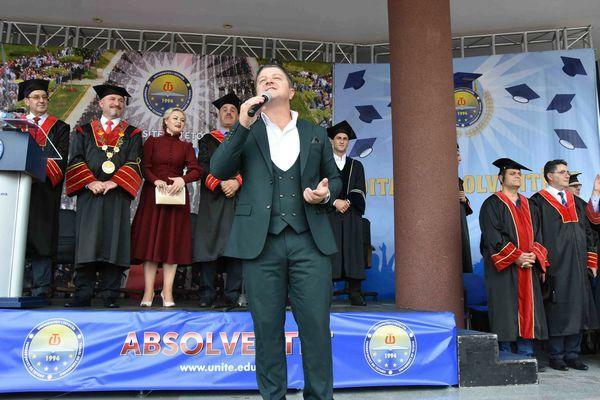 The graduation ceremony of the throwing of hats ended with a rich artistic program, where in front of the senior undergraduates performed university professors, singers Bajramali Idrizi, Selami Kolonja and the singer from Tetovo, Shpat Kasapi.